Does Bone Density Impact the Success of Dental Implants? If you are suffering from tooth loss, dental implants appear to be the ideal solution to replace your missing teeth. While researching them to ensure that they are right for you, you have found that they can be unsuccessful if you have decreased bone density. As a result, you may feel as though they are not suitable for you due to your compromised jawbone. However, do not be too disappointed just yet. Now, new research shows that low skeletal bone density does not affect the success of the procedure. Previously, it was believed that those with decreased bone density were not candidates for dental implants because the jawbone would not offer enough support for the implant posts. Now, a new study has found this to be untrue. 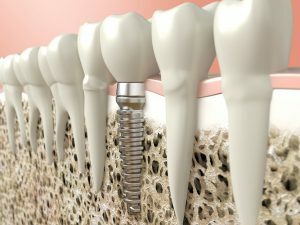 A case-control study was created to analyze how low bone density can impact the success or failure of dental implants. It involved twenty healthy women between the ages of 50 and 80 who had osteoporosis or osteopenia. In addition, 10 age-matched women who had normal bone density and one smoker were also included in the study. Standard-sized dental implants by NobelBiocare were placed and the periapical bone loss was measured from the first thread of the post to the alveolar bone at the base line. These measurements were repeated at 12 and 24 months after their placement. The results found that all implants remained successful and there was no additional bone loss 24 months after their placement. Due to the findings, there is no clinical difference to the success of the procedure when placed in healthy individuals or those with decreased bone density. However, while the results were positive, further testing and treatment is needed to confirm the results before the current clinical methods and candidate recommendations for the procedure are updated. If you are suffering from tooth loss and have decreased bone density, you may still be a candidate for dental implants. To find out if they are right for you, it is best to schedule a consultation with your dentist for an evaluation. In addition to your bone density, there are several other factors that are considered when determining if you are a candidate, such as your medical and lifestyle history. After a comprehensive examination, your dentist will be able to determine if dental implants are the right solution for you. If you are ready to stop living with tooth loss, there are many options available to help you restore your smile. Contact your dentist to discuss your options. Dr. Edward J. Dooley earned his Doctor of Dental Medicine from the University of Pennsylvania’s School of Dental Medicine. After serving his country as a Dental Officer in the Navy and working as an associate dentist in a private practice, he opened his own dental office in 1986. With a commitment to providing excellent dental care, he will help you achieve optimal oral health. If you have any questions about your tooth replacement options, contact Dooley Dental today. Comments Off on Does Bone Density Impact the Success of Dental Implants?